Hot afternoon . The sun shone fierce . But it does not really perceived by the hare . He was fast asleep under a shady tree . Suddenly sweet dreams interrupted . "Help! Help!" Heard shouts and screams over and over again . Then came the sound of marching feet were animals running around . "What is it , anyway ? " said the Mouse Deer . His eyes blinked , felt heavy to be opened because it is still sleepy . In the distance a bunch of animals running toward him . " Fire ! Fire ! " Cried the Goat . " Let's run , Cil ! There was a fire in the woods ! " It's true . The thick smoke soared into the sky . Frightened deer seen . He immediately got up and ran after her friends . Deer kept running . Well, his run too fast . Yes , although smallish mouse deer , but he can run fast . Unnoticed , Mouse Deer ran away , leaving his friends . " Oh , my breathing feels exhausted , " the hare stopped panting , and sat down to rest . " Right, where other animals ? " Although the hare happy to have escaped the danger , he suddenly felt scared . " Well , I was where now ? Apparently never here . " Deer running while observing the surrounding area . " Wow , I'm lost . Myself again . How is this ? '7 hare getting scared and confused . " Lord, save me . " Deer continued to explore the forest that has never been passed. Imperceptibly , he arrived at the edge of the forest . He saw a field belonging to Mr. Farmer . "The field of vegetables and fruits ? Oh , thank goodness . Thank you , God , " hare 's eyes widened . The field is full of vegetables and fruits are ready for harvest . Wow , great fun! " Incidentally ya , I was thirsty and hungry , " said Mouse Deer while swallowing saliva . " My throat felt too dry . And my stomach was growling to be filled . Eat first , ah . " When you wake up the next morning , hare was hungry again . " Oh, the party continued again, here , " said the hare to himself . " This time I'm picky once , ah . Anyone know was my favorite cucumber . " Hare then walked around the broad field of Farmer 's . " Wow , that she was looking for ! " Hare exclaimed happily . " Hmm , timunnya look so fresh . Besarbesar again ! Gee , ya definitely tasty . " 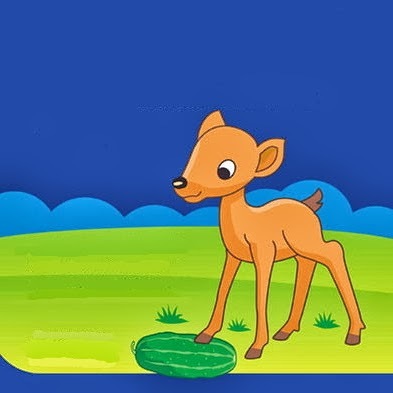 Direct deer ate the cucumber to the full . " Wow , delicious cucumber breakfast , " said the hare with a satisfied smile . Today it was already daylight . Then the hare back under a shady tree to rest . Farmer shocked when he saw his field . " Well , my cucumber field so why mess - so , " Mr. Farmer said grimly . " Action who , yes ? Surely there are vicious new pests . Or might there be a bad boy or a hungry beast that stole my cucumber ? " Field of the cucumber is really a mess . Many trees were damaged cucumber trampled . And many pieces of cucumber that littered the ground . 7 @ Well , be careful, yes , if you get caught ! " Muttered Mr. Farmer wagging his scythe . " My cucumber harvest so messy . " Then all day long Farmer busy straightening back field that was messy . From the place of his rest , Mouse Deer Farmer 's continued attention . "Well , he certainly called Mr. Farmer , " said Mouse Deer to himself . " His mustache may also . Thick , ' black , and curved upward . 's Funny . Hi ... hi ... hi .... Previous hare had never met the man . But he often heard stories about Mr. Farmer from friends her . " Oh , really old Farmer yes , " said the hare . Yeah , he's been waiting a long time . Spot the hare wants to eat cucumber again . Apparently he hooked eat the fresh cucumber . Later that day , Mr. Farmer home while carrying baskets of cucumbers on his shoulder . He came home while complaining , because the harvest is to be reduced . and the time is up for re-arrange the field that was messy . " Ah , finally arrived when I was waiting for , " hare got up and walked to the fields . unruly beast the back feasting on cucumbers Mr. Farmer . The next day , Mr. Farmer furious and angry mess again see his farm . " Truly outrageous ! " Exclaimed Mr. Farmer as she clenched her fist . " It turns out other plants are also damaged and stolen . " Mr. Farmer kneeling on the ground , to record the thief. " Hmm , definitely animal thief , " said Mr. Farmer . " Human footprints do not like this shape. " The poor farm owner was determined to catch the thief. " I had to make a trap to catch him ! " So Mr. Farmer immediately leave the field . Arriving at his house , he made ​​a doll that resembles humans . Then he rubbed the field doll with sticky jackfruit sap ! Farmer returned to the fields . The scarecrow in the middle of installing a cucumber field . It looked just like the people who were on guard . Oversized clothes flapping in the breeze . While head wearing hat , like yours Mr. Farmer . " Well, it seems Mr. Farmer is not alone anymore , " said Mouse Deer , who watch from a distance . " He came with his friend . But why her friend did not say anything , and Mr. Farmer left her alone in the middle of the field ? " Hare waiting for the departure of long time friend Mr. Farmer . Finally she could not stand . " Ah , I'd better get there , " said Mouse Deer decide . "At the same apologized for stealing cucumbers Farmer . Anyone know I was even given free cucumber . " " Excuse me , sir , " regrets hare in front orangorangan the field . " I'm the one who has stolen the Farmer cucumber . Stomach and I was hungry . Bapak not angry , are you? " Of saj , a scarecrow field did not answer . Hare repeatedly apologized . But the puppets remained silent . His smiling face , looks like a mock hare . " Huh , so arrogant ! " hare exclaimed angrily . " I'm sorry I really did not say anything . Fact smirked . Hilarious Who does what ? " he grumbled . Hare finally had enough. Ditinjunya orangorangan the field with the right hand . BuUuk ! Why, why can not hand drawn ? Ditinjunya again with his left hand . BuUuk ! Well, now both hands firmly attached to the body of the doll . "Let go of my hand ! " Cried the hare j single . "If not , I kick you ! " BuUuk ! Kancil feet now instead attached also in the body of a scarecrow . " Oh , how is this ? " In the afternoon , Mr. Tani returned to the fields . " Well , here's the thief ! " Mr. Farmer pleased to see the trap was successful . " Apparently you have damage and steal my cucumber field . " Mr. Farmer laughed when releasing mouse deer . " He said deer animal cunning , " sneered Mr. Farmer . " But why not be fooled by the puppets field . Ha ... ha ... ha .... " hare resigned only when brought home Farmer . She was locked in a chicken coop . But the hare was shocked when Mr. Farmer told his wife to prepare satay seasoning . "I have to go out tonight I j uga " hare determination . If not , I'm finished . " At night, when the whole house was asleep , calling hare dog , the guard house . " Shhh ... Dog , come here , "whispered hare . " Introducing, I hare . New pet Farmer . Do you know ? Tomorrow I will be invited to attend a party at the Farmer house of Mr Headman . Fun , huh ? " Dog shocked . "What I could not believe that I 've long with Mr Tani had not been asked to go . Uh , actually you are invited . " Deer smiled knowingly . " Well , it's up to if you do not believe . See it tomorrow ! I'm not lying ! " Dogs apparently unaffected by the words of the Kancil . He requested that the hare persuade Farmer to mengajakn- go party. " Okay , I 'll try to persuade Mr. Farmer , " promises hare . " But tonight you have to accompany me to sleep in a chicken coop . How ? " Dogs agree with the hare bid . He immediately opened the cage door latch , and entered . Deftly , hare quickly out of the cage . " Thank you , " said Mouse Deer back , closing the door latch . "I'm sorry , you know , I was forced to lie . Say hello yes , for Mr. Farmer . And please pass on my apology to him . " Deer immediately ran from the house of Mr Tani . The poor dog just realized the truth when the hare has disappeared . Clever hare , turn out easily fooled by Mr. Farmer . That is why we should not be arrogant .